When In Manila, how about a day of techno stuff for educators and tech geeks of all ages? The Philippine National Robotics Competition and exhibition is staging the best of robotics stuff made by student robotics inventors and programmers from various schools all over the Philippines. The robotics competition is the yearly gathering of all robotics student inventors and programming. We set-up various robotics games and exhibitions by students. There is also a tech-talk portion where a robotics inventor from Singapore will demonstrate the latest in robotics technology for schools. This is really one exciting event and I do hope you can be part of this show. It will be on January 20, 2012, Friday at the Arena, San Juan City. The program opens at 12:30pm until 4pm. However, the elimination rounds and workshops/seminars will begin as early as 9am. The championship round s in the afternoon. This will be held on January 20, 2012 at the Arena, Santolan Road, San Juan City, and being presented by Genetic Computer Instituted, Pinoy Robot Games Foundation, Data Science Technology Corp. and Tech-Leap Inc. For the whole day, various student participants will demonstrate their rogramming skills and cunning robotics assembly and strategy using their own fabricated / improved robots or robot kits with carefully chosen sensors, i.e. light, touch, distance, etc. For bloggers and media members, we have reserved a special section where you can witness the gaming action as they happen and a special room for food treats. We have also prepared a gift pack for you to remember this fun-filled event. So, please do join us on this momentous event dedicated to all tech-lovers out there. The venue is being co-managed by SM Tickets and they charge only Php50/entrance. For this reason, I have already reserved FREE VIP tickets for bloggers, media members and for your companions. When In Manila, unleash your geekiness and come join us at The Philippine National Robotics Competition and exhibition! For the full program of the event, please visit www.genetic.edu.ph, (2012 Robotics). 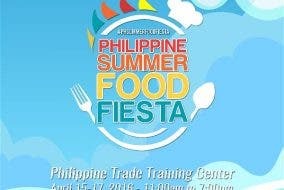 Here Comes the Food Event of the Summer — The Philippine Summer Food Fiesta! “Sad Papaw” Of Twitter Finally Reunited With His Grandkids Over Dinner!